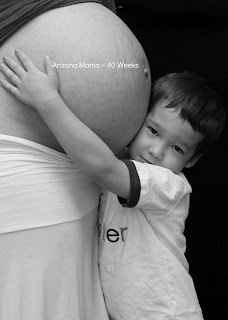 Arizona Mama: I'm 40 Weeks!! Maternity Pictures with Baby Boy's Name Revealed!! I'm 40 Weeks!! 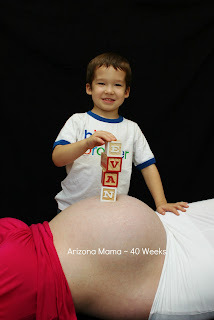 Maternity Pictures with Baby Boy's Name Revealed!! Ok, so I am now 40 weeks! I made it and so far I'm not really seeing an end. I think baby boy is a little too comfortable in there. I am hoping he decides to make his entrance to this world soon, but if he continues to be stubborn I am scheduled to be induced next Monday (the 20th), at which time I will be just a day short of 41 weeks. I told you during one of my recent pregnancy journals that a friend I work with is going to do newborn pictures of baby boy when he arrives. Well, she started playing around with doing maternity pictures of herself and her daughter and they turned out really cute. She offered to do some for me too. I wasn't going to, but since nothing was progressing I figured why not. So Jayden and I made it over to her place for a quick photo shoot. She did an awesome job getting some really cute belly shots, shots with Jayden and baby boy belly, and some of just big brother Jayden. And if you look close in some you will see baby boy's name!! So what do you think?? I think they turned out really cute! 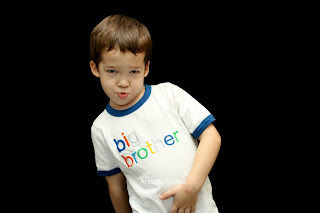 Jayden is such a ham and loved doing some silly poses. John thinks the first picture looks like Jayden is blowing up my belly like a balloon. That was the only shot we got of him kissing my belly because he got shy. He loves to kiss my belly, but in front of my friend it was different. Did you do maternity pictures? Would you? I LOVE LOVE LOVE THEM!!! Jayden is so adorable, love the first big brother one. Such a ham! LOL! Your friend did an amazing job!! I love these pics Nancy! They are fantastic! I have to say I think my favorites are the black and white of Jayden hugging your babybelly, and that first one of just him alone...TOO ADORABLE! God Bless you Mama, that boy is going to be a lady killer! Oh, I also really love the name Evan! I love then and the name! I am due Sept 26! I am getting so excited! My daughter is 3 and LOVES to kiss my belly...but my belly is not as cute and round as yours! OMGosh I LOVE these!!! So so beautiful and Jayden is so adorable! You look fantastic too! 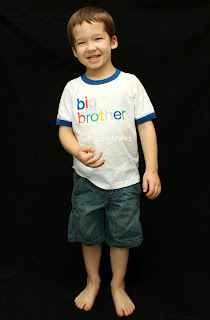 I hope your little guy makes his appearance any minute now :) I can't wait to hear. Oh and I love the name Evan, very cute. Great pics! 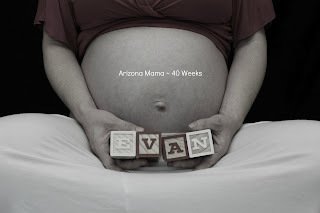 I really like Evan as a name. This post is so adorable! Great name, too. I love your maternity pics! They came out adorable!! Absolutely adorable!!! Love the pics and the name!! :) Can't wait to see lil Evan! Gorgeous pictures and I love the name! Ps- not in a creepy way.. but your stomach looks great .. not a strech mark!! 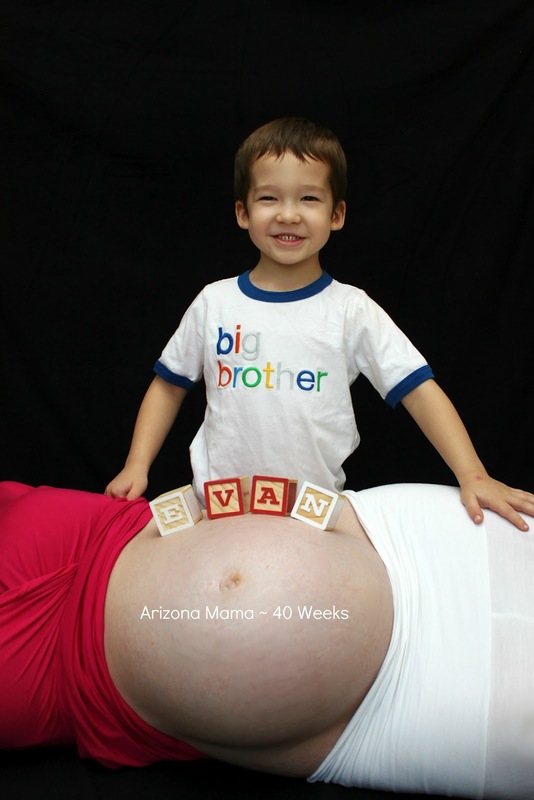 My brother-in-law is an Evan also :-) I love the name! You look beautiful and I love your name choice!! Love the name. Your son is adorable! Beautiful photos and I love the name!! Can't wait for that baby boy to arrive!!! Yay the name is out! woohoo! I love the pics :-) I can't wait to get big to get some done too! I hope you won't mind a guy saying this,but you truly do have one of the biggest,roundest and most BEAUTIFUL pregnant bellies I've ever seen!!!!!!!!!!!!!!!!!! !